For the past couple year Google has been rolling out their free “Get Your Business Online” seminar initiative worldwide and today Phoenix, Arizona made the cut. 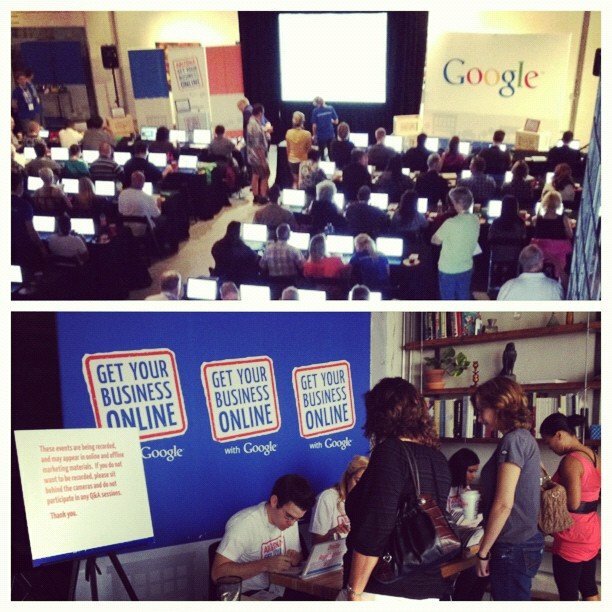 In July of last year, Google offered up their first US-based “Get Your Business Online” seminar in Texas in connection with a host of regional and national partners including Intuit.com and Score.org together with a handful of local chambers and local business organizations. Today’s seminar here in Arizona included helpful information for local business owners including how to set up a free website and hosting plan with Intuit as well as how to take the DIY approach to building your online presence via Google places, Google+ Local, Search Engine Optimization, and Pay per Click. With this approach, Google is definitely taking a page from the Internet Marketing Community who have pushed Google products and supported business both locally and nationally for years. Google’s offer of a freebie with a high-perceived value in exchange for visitor information and the potential upsell opportunity in the future is a plus. The positive PR with the local business community is also of value for Google and should most certainly compel local businesses to better adopt Google’s arsenal of local business products and services. Is their even an alternative? If Yahoo! conducted such an event, would anybody even attend? From an internet marketer’s vantage point, I appreciate the grassroots buzz and instruction provided and know that it will only further the reason that small businesses select companies like Local One to manage their online marketing campaigns in both Arizona and beyond. Many attendees will find success in doing a few of the things that Google has shared today while others will find reason to look for an internet marketing company in Phoenix or an SEO company who can help them do a better job than they otherwise could do alone. Thanks Google! On behalf of internet marketing companies like Local One, keep the changes and awareness coming.